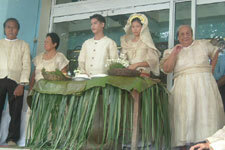 A grand motorcade with Kabulakan Festival muses and decorated tartanillas, and a "Kasalan sa Dauin" cultural presentation depicting wedding traditions in the nearby town of Dauin opened the event. Local models wearing premier Dumaguete bridal creations for the "Maanyag nga Lalik Fashion Show" walked down the Bethel Guest House stairs into the waiting romantic Boulevard at the end of the first day. In the course of the two-day event, the first-ever wedding fair in Dumaguete City, entrepreneurs and businessmen were given tips on how to start their own businesses by the Department of Trade and Industry. Interested couples and families were treated to a rondalla and folk dance presentation, and exposed to the techniques used in making bridal bouquets, applying makeup and styling hair, and arranging and skirting wedding tables. KeyCities Events and Marketing Head Glynda Descuatan said, "As the organizer, I was deeply touched by the enthusiasm and the cooperation. This may be our first but the desire for excellence is there. The activity opened new ideas for business, new contacts and new ways of doing business." The rest of the cities in the road show, from Tarlac to Manila, most certainly have their work cut out for them as Kasal.com, the entity behind Kasalang Filipino, constantly urges the maximizing of the uniqueness of local products. In fact, on the 2nd day, well-known event stylist Henry Pascual said, while demonstrating how he could arrange fuchsia roses in a low vase made of lahar, "Why buy imported when we can go local?" Just watching him talk about styling themed wedding receptions and using local pistachio green carnations, sinamumus from Davao, and white roses from Baguio, one could indeed ask, "Why not?" Anyone could say with pride that Dumagueteños took that to heart in the 2007 Kasalang Filipino as the exhibits truly showcased Negrense artistry and craftsmanship. Pam Galvez, gown and jewelry designer of the Boom's Garments, said that upon the organizers' encouragement to use local materials, she came up with a "set of creations emphasizing more on the materials used." On the May 25 fashion show, her contemporary designs using simple lines-halter and the basic balloon-more than gave focus to the breezy banig lining visible underneath the soft cheese cloth or delicately crumpled katsa. "People don't have to go all out and buy organzas and chiffon. Gowns like this definitely add a little extra oomph to any wedding," she said. "It's very classy, making it acceptable in any church aisle, and it says something about Filipino's creativity." Classy could also aptly describe the jewelry displayed. Necklaces with polished corals and carved shells accentuating mined amber or freshwater pearls and Japanese beads are beautiful accents on wedding gowns. "It's the gems we know; the genuine mined stones, Spanish heirlooms and excavation pieces, some from right here in Dumaguete," she said. This leads us to the budbud kabog, the city's specialty, a kind of suman made from birdseed (fine rice grains which cost Php180 per kilo), and Isabel "Boom" Roxas' original recipe of bibingkang kabog of the same ingredient. Launched last year at the Buglasan Festival of Negros Oriental, Roxas arranged the bibingka into a three- tiered bibingkang kabog cake, trimmed with banana leaves, local flowers and pyramid deep sea shells taken from deep sea areas going to Siquijor. 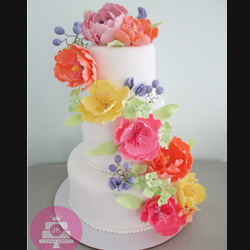 "[If you ask me,] the Negros touch can compete with the national wedding scene," she said. When Bong Callao of Arte de Negros said 100% wood, he meant it. "Our furniture is unique because we do not use nails, just wooden pegs." "Useless" hardwood or driftwood taken from old Negros Oriental houses and fences take his crew of 20-30 skilled workers in Brgy. Junob, Dumaguete two weeks to finish a customized piece. He said, "We design for an hour or two because it depends on the character and shape of the wood. This is why it's called the arts of Negros." they also fuse wood and wrought iron, sometimes buying old wooden train rails in Bais City for the iron pegs. "I started this as a hobby three years ago. I was fond of building wooden furniture for my house. But friends kept on asking me for the sala sets I make. I just gave it to them and made new ones. But it kept on happening!" He pointed to a sala set with kamago or "iron wood" for seats and perfectly rounded wooden balls for armrests. "I do not even know now how many sala sets, kasintahans (loveseats) or long benches we have made already." But for weddings looking for the character only unique wooden trellises on top of a beautifully carved kasintahan could provide, Arte de Negros is truly recommended. 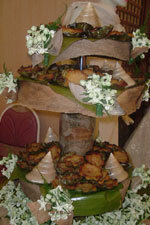 He concluded, "We have so many concepts and we can rent for all occasions. Bawal lang ang patay." "Most people appreciate the beauty of the stone craft pieces we exhibit, but they get shocked at the price," said Donna Elizaga, part of the marketing staff of Negros Oriental Arts and Heritage (NOAH). Established in 1983, NOAH started with slabs of stones etched with Bible verses in Bacong, Negros Oriental. Now, with 150 workers, they have taken stone craft into a new level with an intricate process that takes 60-90 days to make, depending on the size and design. "First we put a brass pattern lining the design, then we inlay the precious stones one by one by hand. We use snow white, red and blue stones and jade, all locally supplied. Then it is polished and laminated for that special shine and protection," she said. She added that it's not often done in other places because it is so intricate and takes a long time. "But jewelry boxes like these, with the couple's pictures and names laid in the middle of the stone design, make for good wedding souvenirs that are truly memorable." 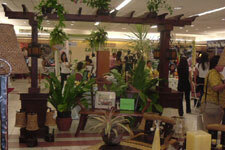 Aside from these exhibits, there were also others that stood out for the products and services that they offered. Wedding pampering by Cuttin' Loose Hair and Nails, David's Salon/ Dermaline, and the Grand Royale Spa; and, Siquijor and Apo Island packages of Orientwind Travel and Tours were presented. Mouth-watering, not to mention colourfully frosted cakes, were exhibited by Chantilly and Sans Rival Cakes and Pastries. 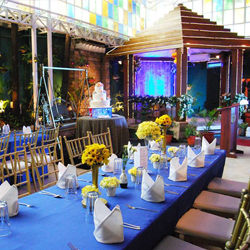 Creative Concepts and Expressions Flower Shop featured both wild and elegant blooms, while elegant invitations were showcased by 2R2A Odlanoid Technology, QP Designs (Manila-based) and AACTECH Computer Solutions. Rendon's Fashion Shoppe and Wedding Services gave a glimpse of Dumaguete fashion as both The Agencia Belen Pawnshop and Jewelry Store and Belcinia Jewelry sported some local blings. Aldea Photo, Ariel Javelosa (Manila-based) and Imagebank showed their best portraits and video works while Lindai's Catering Services, Bethel Guest House and La Caviteña Restaurant battled for the most sumptuous offerings. 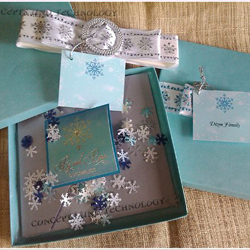 Nice wedding souvenir items were available at DJD Handcrafted Gifts, Orient Gifts and SOMEONE; and, Lotiff Construction introduced model homes for they newlyweds. With such a wealth of creativity and outpouring of information on wedding preparation, the Dumaguete wedding industry could truly come up roses the next time Kasalang Filipino comes around. See you in 2009! Please visit www.kasal.com for the exhibitors' complete contact details. 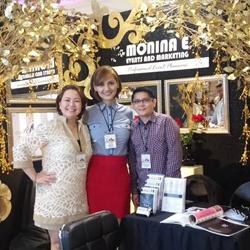 Kasalang Filipino is a nationwide wedding fair road show aimed at tying 10 Philippine cities with one goal of promoting the local wedding industry. The following are the 10 cities of the 2007 road show - Tagaytay, Legaspi, Dumaguete, Tarlac, Cagayan de Oro, Iloilo, Davao, San Pablo, Cebu, and Manila. Kasalang Filipino 2007 is co-presented by Kasal.com and ABS-CBN; and is made possible by Philippine Airlines, Fuji-YKL, Chinabank, Standard Appliances, Colgate-Palmolive, Red Hat, MozCom PayEasy, QP Designs, Ariel Javelosa Photo & Video, Bitstop Network Services, and the following media partners: ABS-CBN Regional Network Group, Lifestyle Network, DWRR, My Only Radio, Metro Weddings magazine, Philippine News, Manila Bulletin's About Weddings, Business World, Business World High Life, The Manila Times, Real Living magazine, Flavors magazine, Entrepreneur magazine, The Beat magazine, Sun.Star, OFW Ngayon, Media G8way, loCalDirect, Philstar.com, Yehey.com, HerWord.com, PinoyExchange.com, DigitalFilipino.com, Tsinoy.com, Trabaho.com and ThePinoy.net.